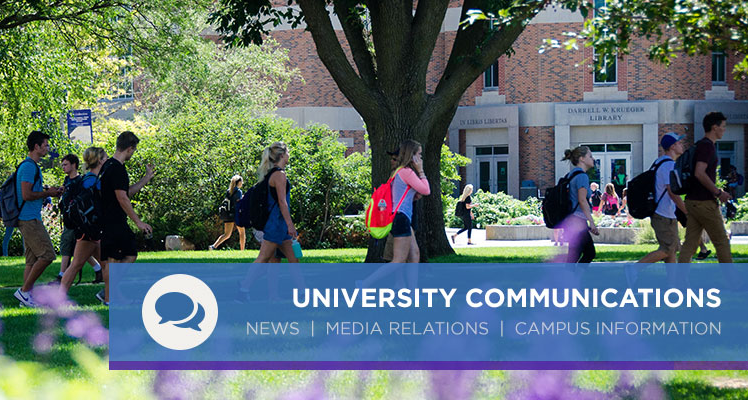 The Winona State University Communications Office manages media relations for the university as well as external and internal communications. WSU Update-- the primary internal communication tool for the university. Distributed daily during the academic year via e-mail to all students, employees, retirees and friends of the university. WSU News Blog --the primary external communication tool for the university, including event announcements and feature stories. WSU Events Calendar -- a comprehensive online listing of public campus events. Currents-- a print and online magazine distributed to more than 46,000 alumni and friends of WSU. All University Emails-- internal communication sent to all faculty, staff and students with critical information. The communications department connects with local and regional media outlets in Winona, Rochester, La Crosse and the Twin Cities. See the full list of media outlets. University Communications typically notifies hometown newspapers of Dean's list honorees within eight weeks after the end of a semester. Contact 507.457.5024 or WSUNews@winona.edu for questions regarding media notification. Learn more about the Dean's List criteria. Any student, employee or club may request publicity for WSU related announcements, events, developments, activities or achievements. Not all requests merit promotion in all venues, but our objective is to work with you to find the appropriate vehicle for your information. Any student, employee or club may request photography services from WSU's University Communications. Services offered are professional headshots, event photography and other photography coverage as deemed appropriate by University Communications. Learn more about requesting photography services and how to opt-out of on-campus photography. You can request campus communications support through the MarComm OneStop request form. Explore your options to promote an event, request photography services and tell your story through campus media channels and more. If you have questions, visit the FAQs page. Use the MarComm OneStop request form to promote an event, print documents, update your website, tell your story through campus media channels and more.